DETROIT -- Trailing by 11 points with 3:45 left in the fourth quarter, the New York Knicks went on 13-1 to stun the Los Angeles Lakers, 124-123 on Sunday afternoon at the Madison Square Garden. Ir wash the Lakers' third consecutive and fell to 31-39 in the standings, nine games out of the playoffs picture in the Western Conference. After beating the Chicago Bulls on Tuesday at the United Center, the Lakers lost to the Raptors, the Pistons and the Knicks, the worst team in the NBA with a 14-55 record. Emmaneul Mudiay led the Knicks with 28 points and eight assists while DeAndre Jordan had 15 points and 17 rebounds. Kevin Knox added 19 for New York, which snapped an eight-game losing streak. LeBron James, who sat out the Pistons game in Detroit, came back to action and paced the Lakers with 33 points and eight assists. Kyle Kuzma had 18 while JaVale McGee added 12 points and 11 rebounds. The Lakers also got 14 points from Reggie Bullock. 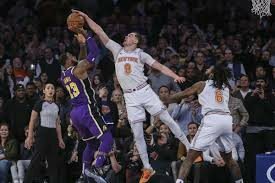 With 2.3 ticks to go and his team trailing by one, LeBron had a chance to get the Lakers the win, but his shot was blocked by Mario Hezonja. James was held to 4-of-15 in the payoff period. "WE didn't close the game out. Being the competitor that I am, it bothers me that I didn't make enough plays down the stretch," James told reporters after the nail-biter. The Lakers made 47 of their 97 shots but struggled fron long distance, 7-of-27. The Knicks, meanwhile, hit 49 of 76 field goals (57.9 percent) and 12 of 26 triples (46.2 percent). Click here to view a list of other articles written by Ahmad Shah.